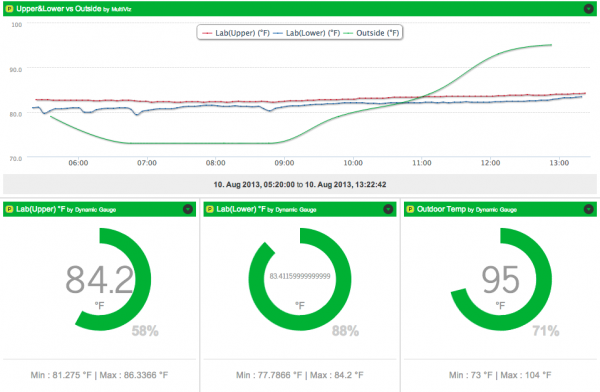 Raspberry PI: Charting Ambient vs Outside Temperature @RaspberryPi #piday #raspberrypi « Adafruit Industries – Makers, hackers, artists, designers and engineers! Reading the graph above is pretty obvious. It plots the temperature of the DS18B20 sensor connected to the Raspberry PI vs. the outside temperature that is provided by a local weather forecast feed. Just for fun, we also display Min and Max temperatures (which can be reset). The graphing is provided by sen.se. The sen.se site offers a lot of flexibility with “the internet of things”. sen.se is free. Sign up and scan the tutorials. The site is well laid out and the tutorials are very straight forward; you’ll be an expect in no time. Full how-to with source code and more here!